*Functional is here defined as implied by the Name "Insulin-like Growth Factor Binding-Protein-3", i.e. the fraction of intact protein and fragments, that have retained the ability to bind IGF´s. This fraction corresponds to the fraction, that is detected on western-ligand blots. The availability of IGF-I and –II is regulated by a complex system. Beside the regulation of the biosynthesis of the peptides another mechanism is to enhance the bioavailability by decreasing the affinity of the IGFBP´s. One of the mechanisms is the release of bound IGF´s from IGFBP´s by proteases, generating fragments with reduced or no affinity for the IGF´s. For IGFBP-3, there are reports on a number of proteolytical fragments of 30 kDa, 22 – 25 kDa and 16 kDa, with reduced or no detectable affinity for the IGF´s. With western-ligand blotting only intact IGFBP-3 and fragments with affinity to IGF´s are detected. In samples with high protease activties discrepancies between the results obtained by western-ligand blotting and conventional immunoassays have been observed, because depending on the antibodies either only the intact IGFBP´s or also active and inactive fragments are detected (1-5).So western blotting is used as an alternative (7). In a study with the IGFBP-3 ALICIA Rinaldi et al demonstrated, that the molar ratio of IGF-I and functional IGFBP-3 showed a significant and direct association with breast cancer risk (6). The ibt Functional IGFBP-3 ALICIA is the first commercially available assay that permits measurement of only functional IGFBP-3, i.e. 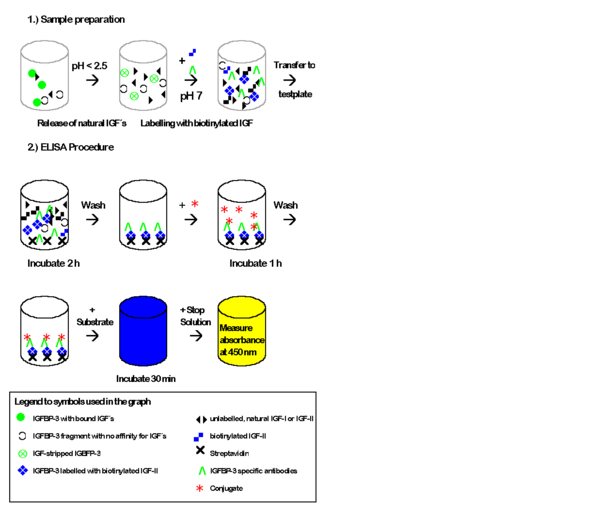 IGFBP-3 and fragments that can bind IGF´s. It combines the advantages of western(-ligand) blotting with the speed and convenience of an ELISA (see Principle of the Test). The levels of IGFBP-3 and IGF-I in serum reflects the endogenous pulsatile level of growth hormone in children and adolecscents. The levels of IGFBP-3 and IGF-I exhibit little diurnal variation. Therefore, a single measurement is sufficient for the diagnosis of growth hormone deficiency or excess. In normal sera, the levels of IGFBP-3 and IGF-I are strongly correlated. The ibt Functional IGFBP-3 ALICIA has been calibrated using non-proteolyzed standards. The results in sera without detectable IGFBP-3 protease activity can be correlated with conventional assays. In addition to conventional applications the ibt Functional IGFBP-3 ALICIA may be a helpful tool for IGFBP-3 measurement in all physiological conditions and diseases with elevated IGFBP-3 protease activities, where conventional immunoassays may give discrepant results. During sample preparation natural IGF´s are released from their IGFBP´s. Functional IGFBP´s are labelled with an excess of biotinylated IGF-II and are bound to a microtiterplate coated with Streptavidin. In the same step, the specific primary antibody binds to IGFBP-3. IGFBP fragments, that have lost their affinities are not bound and are washed away in the subsequent washing step. The primary antibody, which is bound to functional IGFBP-3 is then detected by a secondary peroxidase-conjugate antibody. The reaction is stopped by addition of acid and the blue colour turns to yellow. The measured absorbance is directly proportional to the quantity of functional IGFBP-3. 2. Lyophilized standards. 240 ng/ml, 160 ng/ml, 120 ng/ml, 80 ng/ml, 40 ng/ml and 20 ng/ml. 3. Ligand-Antibody-Mix, biotinylated IGF-II plus primary antibody, lyophilized. 4. Conjugate, peroxidase-conjugated secondary antibody, lyophilized. 5. Acidification Buffer, contains phosphoric acid, 75 ml. Ready for use. Caution: caustic. 6. Assay Buffer, buffered solution for reconstitution and dilution of Ligand-Antibody-Mix and dilution of Conjugate. 100 ml. Ready for-use. 8. Substrate, TMB, 11 ml. Ready for use. 9. Stop Solution, 0,2 M sulfuric acid11 ml. Ready for use. Caution: caustic. The ibt functional IGFBP-3 ALICIA is for in-vitro use only! 7.1.2 Dissolve standards with 250 µl distilled or demineralized water. Mix carefully and allow keep at room temperature for at least 30 minutes to ensure complete dissolution. If the standards are not used the same day, they should be frozen in aliquots at -20 °C. 7.1.3 Reconstitute the Ligand/Antibody-Mix with 110 µl of distilled or demineralized water to yield a stock solution. The stock solution should be used within one week. Prepare the required quantity of working solution by dilution of 1 volume of the stock solution with 100 volumes of Assay Buffer. 7.1.4 Conjugate: Prepare the required quantity of working solution of the Conjugate by dilution of 1 volume with 2000 volumes of Assaybuffer (e.g. 1 ul conjugate with 2ml Assaybuffer). 7.1.5 Prepare the required amount of washing buffer by dilution of 1 volume of the concentrated washing buffer with 9 volumes of distilled or demineralized water. Do not dilute the standards, the standards are diluted ready for use! Normal sera should be diluted 1 + 25 (dilution factor 26), e.g. 10 µl serum plus 250µl Assay buffer. If high values (> 6000 ng/ml) are expected, a higher dilution should be used (as e.g. 1:50), so that the concentration of the diluted sample is within the range of the standard curve (240 – 20 ng/ml). If low values (< 500 ng/ml) are expected, the sera may be used undiluted. Serum samples should be stored for a maximum of 24 hours at 2 - 8 ° C. For long term storage serum samples should be stored in aliquots at -20 °C. Though IGFBP-3 is very stable, multiple freeze-thawing cycles should be avoided. Mix 1 volume of standards and samples with 10 volumes of Acidification Buffer, e.g. 10 µl of standard or diluted sample with 90 µl of Acidification Buffer. Mix thoroughly and keep at room temperature for 10 minutes. Mix the acidified standards and samples with 200 µl of the Ligand-Antibody-Mix. Mix thoroughly. 7.2.4 Preparation of non-serum samples: For other samples than serum (as e.g. other body fluids, cell culture supernatants, tissue extracts) the pH should be checked after extraction and neutralization with biotin IGF-II, as the pH is influenced by the sample matrix. The pH after acidification should be in the range of 1.9 to 2.4. For samples with very low concentrations it is recomended to add 1/10 volume of 0.5 M H3PO4. After addition of the Ligand/Antibody-Mix the pH should be at pH 7.5 (+ 0.75). A test may be done by mixing 1 volume of the acidified sample with 2 volumes of assay buffer. Plasma samples: Heparin may influence the ligand binding reaction. Samples containing preservatives: Sodium azide is an inhibitor of Horseradish Peroxidase and should not be used. 7.3.1 Dispense 100 µl of assay buffer per well as blank value. Dispense 100 µl per well of each labelled standard or sample in duplicates into the wells of the microtiter plate. Incubate for two hours at room temperature (18-25° C). 7.3.3 Add 100 µl of the conjugate solution to each well and incubate for 1 hour at room temperature. 7.3.5 Add 100 µl of substrate to each well of the microtiter plate. To minimize imprecision, this should be done by a multichannel pipette or in timed intervals. Incubate for 30 minutes at room temperature. 7.3.6 Stop reaction by adding 100 µl of stop solution to each well. To minimize imprecision, this should be done by a multichannel pipette or in timed intervals as in step 5. The blue colour will turn yellow upon addition of the stop solution. 7.3.7 Measure the absorbance of each well at 450 nm (reference 650 nm). Dissolution of lyophilized reagents – it is essential to dissolve the lyophilzed reagents completely! 1.) Gargowsky SE et al. : Measurement and characterization of insulin-like growth factor binding protein-3 in human biological fluids: discrepancies between radioimmunoassay and ligand blotting. Endocrinology 1992; 131: 3051-3060. 2.) Giudice LC et al. : Insulin-like growth factor binding proteins in maternal serum throughout gestation and in the purperium: effects of a pregnancy associated serum protease activity. J Clin Endocrinol Metab 1990; 71: 806-816. 3.) Hossenlopp P et al. : Evidence of enzymatic degradation of insulin-like growth factor binding proteins in the "150 K" complex during preganancy. J Clin Endocrinol Metab 1990; 71 797-805. 4.) Lassarre C et al. : Protease-induced Alteration of Insulin-like Growth Factor Binding Protein-3 as Detected by Radioimmunoassay. Agreement with Ligand Blotting Data. Growth Regulation 1994; 4:48-55. 5.) Lindgren BF et al. : Growth Retardation in Constitutionally Short Children is Related both to Low Serum Levels of Insulin-like Growth Factor-I and its Reduced Bioavailability. Growth Regulation 1996; 6: 158-164. 6.) Rinaldi et al. : Insulin-Like Growth Factor-I, IGF Binding Protein-3, and Breast Cancer in Young Women: A comparison of Risk Estimates Using Different Peptide Assays. Cancer Epidemol Biomarkers Prev 2005; 14(1), 48-52.